« MARIJUANA AND THE UNKNOWN! 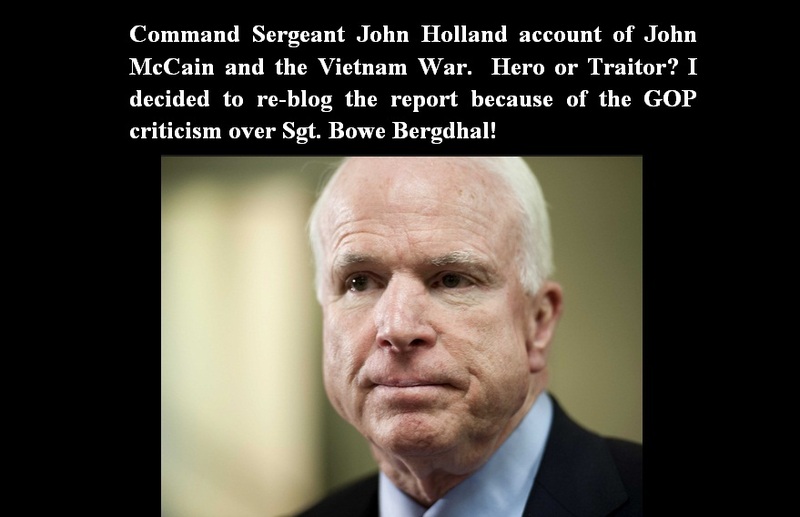 Command Sergeant John Holland account of John McCain and the Vietnam War. Hero or Traitor? I decided to re-blog the report because of the GOP criticism over Sgt. Bowe Bergdhal! Why was the truth kept from Americans during the election? With McCain supporters continually touting his heroism and attacking Democrats that served honorably in Vietnam like John Kerry and Al Gore, the unavoidable embarrassment that their standard bearer may have been the biggest American traitor since Benedict Arnold, confidence in Conservative news sources has to disappear, at least with veterans. According to sources, it was John McCain that fired the rocket that caused the Forrestal incident, the most serious disaster on an American ship. Stories make him out to be a “hero” and an “unnamed” total idiot is blamed. McCain is said to be that idiot with his daddy running cover for him. Thus far, Jane Fonda has never attacked one of our ships. We will be taking a look at both McCain and Fonda and try to verify claims. Perhaps they could have a contest to see who killed the most Americans. No tally as to how many pilots were shot down using intel McCain admits giving the North Vietnamese has been made. The Forrestal incident may be a huge cover up in itself. This entry was posted on June 5, 2014 at 8:15 am and is filed under Uncategorized with tags Afghanistan, Command Sgt. John Holland, Iraq, John Holland, John Kerry, john mccain, McCain, McCain - Traitor or Hero, McCain Conflicting Account, McCain Warmonger, Nixon Pardon's John McCain, President Obama, Republicans, Sgt. Bowe Bergdhal, Vietnam. You can follow any responses to this entry through the RSS 2.0 feed. Both comments and pings are currently closed.